The Elephant's Caretaker Collapses To The Ground. What She Does? I Have CHILLS! The Elephant’s Caretaker Collapses To The Ground. What She Does? I Have CHILLS! Elephants are one of the largest living mammals and the Asian and African elephants are the two prominent species. These herbivorous giants have been used as work animals for construction, tourism, warfare and entertainment purposes ever since the Indus Valley Civilization. Generally the female elephants form a group of more than ten elephants which include three pairs of mother and their offspring. The eldest female member leads the group till her death or is incapable of handling the group. The males however prefer to stay alone or sometimes make small herds with other males. 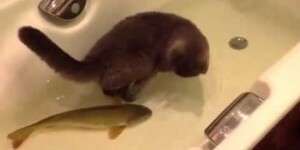 They are also highly intelligent animals and are known to use tools for solving problems. Also a certain group of scientists believe that elephants are capable of displaying emotion; when they come across bones of other elephants, they display interest irrespective of the fact that the deceased was related to them or not. These giants are friendly in nature and develop a close bond with their human handlers much like other domestic animals. They become protective of their care takers and have a tendency to please their handlers. 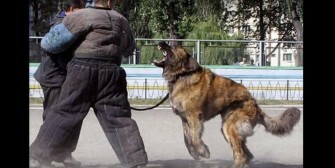 Here we can see how the lovable creature comes running to the rescue of her handler when he is attacked. When the perpetrator comes hurling in at the elephant handler, the animal senses the danger and comes running to her handler’s help. She wards of the attacker and carefully guards against any further threat. Her concern for the safety of her human friend is clearly visible when she strokes him with her trunk; an activity elephants generally use to greet or pacify other members of a herd. It is hard to imagine how people want to kill these lovely beings who have nothing other than love and compassion in their huge hearts. We humans are the most intelligent creatures in the world and are supposed to be care takers of all the lesser intelligent species. Instead we indulge in reckless killing of animals and destruction of fauna. Maybe it is time we take a lesson or two from these mute animals. If the seventeen year old elephant tugged your heart do not forget to share it with your friends and family. See How Easily a Rat Can Wriggle Up Your Toilet! I Love India, Do You? 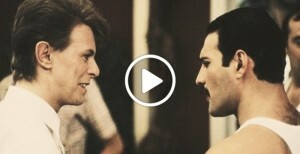 How ‘Under Pressure’ Sounds Without Music: Freddie Mercury And David Bowie A Cappella! David Bowie, Queen & Annie Lennox Came Together For This Song & Gave Us All A Night To Remember! 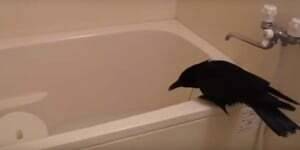 He Recorded This Crow Do Something n Really Surprising! 20 Years On, This Video Of SRK & Kajol Remembering DDLJ Will Make You Fall In Love Yet Again! Top 10 Water Slides That Will Make Your Heart Race Like Never Before! Copyright © 2015 Iloveindia | All rights reserved.